Is it Bedtime yet? : Let's catch up. I've left the house a couple of times, so that's something. We had dinners and playtime over at Dad & Cindy's twice. The children like to use my father as a trampoline while I pretend not to notice. We got some more snow, and the kids insisted on being pulled around by the ATV again. I would have taken some pictures, but I was on the couch reading and staying warm while I left Pepaw on his own. Derek didn't ever want to come in, even though the temps were in the 20's. But maybe the joke was on me, because after all that time in the cold Derek woke up around midnight with a croupy cough that sounded just terrible. We hung out in a steamy bathroom for a bit, and then I slept in a sleeping bag on his floor for the night to make sure he was okay. I used to sleep just fine on a floor, but I'm now feeling every bit of my 32 years, 10 months, and 8 days. Looking forward to something a little softer tonight. Alex started back to school this week. She's doing well, but between you and me, her teacher is kind of odd. Today I took my shower upstairs in my mom's bathroom because Derek was napping downstairs and I didn't want to wake him. A very unfortuate thing happened. Her bathroom has a window and sunlight was streaming in. And then I made the mistake of looking into her super-magnifying mirror. I used to stay home because I liked to. Now I'm thinking I shouldn't be leaving the house for the good of all mankind. Holy illuminated and magnified pores, Batman. I think I need a facial. Or maybe I should become nocturnal. Lots of people are asking me when I'm returning to North Carolina. How's that for clearing things up? Maybe when April doesn't seem so far away. 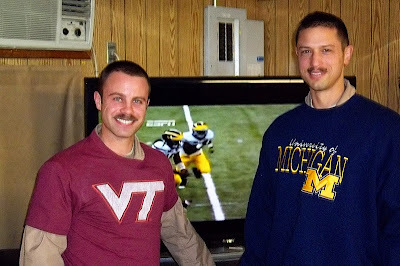 Tonight Josh and I are skyping off and on while we watch Michigan play in the bowl game. It's tied with 5 minutes left, and I am expending my nervous energy blogging. Close games give me ulcers. But once they're over, I'm back to my cheerful self. Even if we lose. Here's Josh watching with a couple guys from the squadron. There's the obvious guy, and then there's the furry creatures hanging out under their noses. Once we hit the deployment halfway mark, Josh started to grow the hair on his head back. He must want me to be able to run my fingers through his mane when he returns. Pedostache needs to stay in Afghanistan. Now we're up by three with 4 minutes to go. Now we're up with 1 minute left to go, but the Hokies are knocking on the door of the endzone. ESPN should pay me for these updates. 5 seconds left, Hokies in field goal range. Game tied. Going to overtime. Not even blogging can help me now. Football is way better than soccer. Don't tell the Spaniards I said so. Why does he grow a mustache? Hmmm? And for the love.... What books are you reading already? Hunger Games? Mom to two and wife to an Air Force pilot. We move about every other day, and are currently located in Korea. My goal each day is to make it to bedtime without raising my voice. I'll let you know when I'm successful. My armpits are blue, and other things.